Overview The GXW-4104 offers an easy to manage, easy to configure IP communications solution for any small business or businesses with virtual and/or branch locations who want to leverage their broadband network and/or add new IP Technology to their current phone system. 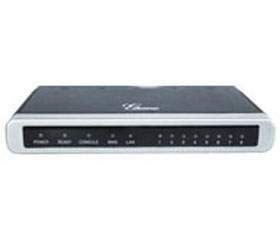 The Grandstream Enterprise Analog VoIP Gateway GXW410x series converts SIP/RTP IP calls to traditional PSTN calls. There are two models - the GXW4104 and GXW4108, which have either 4 and 8 FXO ports respectively. One stage dialing means user only hear dial-tone once and input a final destination number along with a pre-fix. One stage dialing need SIP server to support SIP call forward via a dial-plan. Channel configurable for one stage or two stage dialing, Default is 2 stage dialing. Channel configurable for one stage or two stage dialing, Default is 2 stage dialing. One stage dialing requires user to configure Off-Hook Auto Dial to a SIP Number. - Enable current disconnect: default of disabled. Some special PBXs and CO lines use line power drop to indicate PSTN hang-up. When this is the configuration, please consult your PSTN line service provider for the correct PSTN disconnect method. - AC termination impedance: default North America. This impedance works with parameters of Busy/Re-order tone in Call Progress Table. Users have to set BUSY/REORDER tone values to enable this parameter. - x,y - 0-9 digit. Configure other channel settings, PSTN Silence Timeout, default 60 sec. This serves as a last measure to address PSTN run-away calls. It is not supposed to replace above regular PSTN disconnect methods. Ovaj proizvod je uvršten u naš katalog dana Monday 26 November, 2007.